After centuries of near dormancy, the concept of 'universal jurisdiction' has suddenly become an important legal tool in the international campaign against impunity, most prominently in high-profile criminal trials. Among the legal questions raised by the exercise of universal jurisdiction, this book considers two. Under what conditions is a country investigating or prosecuting a foreigner for an extraterritorial offence internationally competent? What is the basis in municipal law for the exercise of universal jurisdiction? Reydams first identifies the international legal issues that arise when a State exercises extraterritorial jurisdiction generally, discerns the different doctrinal concepts of universal jurisdiction, and traces universal jurisdiction in current international texts such as multilateral conventions, resolutions of intergovernmental bodies, and official drafts and studies. 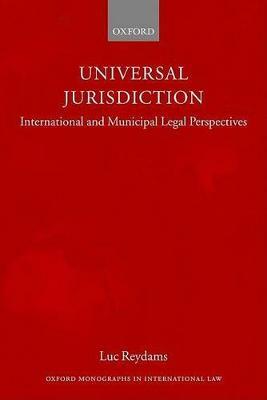 He then brings together, and makes accessible in English, detailed accounts of universal jurisdiction in fourteen countries: Australia, Austria, Belgium, Canada, Denmark, France, Germany, Israel, the Netherlands, Senegal, Spain, Switzerland, the United Kingdom, and the United States. Reydams' point of departure is the need for a context-sensitive analysis. The municipal laws are thus placed in the larger context of a country's views on criminal jurisdiction generally and the case discussions pay detailed attention to the factual and legal context of each case. This approach provides the reader with the reasons why the individual was brought to justice in a third country. The inclusion of (translated) texts of municipal statutes, of (translated) excerpts from judicial decisions, and of commentaries by legal scholars makes this volume an important resource for decision makers and legal practitioners, both national and international. Luc Reydams is Adjunct Assistant Professor at the University of Notre Dame.